This week Confucius Institute Directors from 26 European countries are meeting at Edinburgh University to discuss future development of Confucius Institutes and Classrooms. Confucius Institutes and Classrooms offer a great opportunity for European people, especially young people, to learn Chinese language and study Chinese culture. Their better understanding of China will promote Sino-European exchanges and cooperation in business, culture, education, science and many other areas. The UK leads Europe in opening Confucius Institutes. Two years ago when I came to Britain, there were 12 Confucius Institutes and 53 Confucius Classrooms across UK. Now the numbers are 20 and 63 respectively. Twenty more British universities have filed applications to open Confucius Institutes. Scotland has the highest rate, per capita, in the UK with 3 Confucius Institutes and 9 Confucius Classrooms. 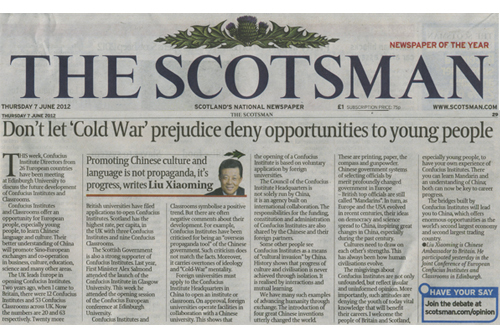 The Scottish Government is also a strong supporter of Confucius Institutes. Last year, First Minister, Alex Salmond, attended the launch of the Confucius Institute in Glasgow University. This week he attended the opening session of the European conference at Edinburgh University. Confucius Institutes and Classrooms symbolise a positive trend. But there are often negative comments about their development. For example, Confucius Institutes have been criticised for being ‘overseas propaganda tool’ of the Chinese government. Such criticism does not match the facts. Moreover, it carries strong overtones of ideology and ‘cold-war’ mentality. Foreign universities must apply to the Confucius Institute Headquarters in China to open an Institute or Classroom. On approval, foreign universities operate all facilities in collaboration with a Chinese university. This principle shows that the opening of a Confucius Institute is based on voluntary application by foreign universities. The Council of the Confucius Institute Headquarters is not solely run by China. Rather, it is an agency built on international collaboration. The responsibilities for the funding, constitution and administration of Confucius Institutes are also shared by Chinese and their foreign partners. Some other people see Confucius Institutes as a means of ‘cultural invasion’ by China. History shows that progress of a culture and civilisation is never achieved through isolation. It is realised by interactions and mutual learning. We have many such examples of advancing humanity through exchange. The introduction of four great Chinese inventions utterly changed the world. These are printing, paper, the compass and gunpowder. Chinese government systems of selecting officials by merit profoundly changed government in Europe-- British top officials are still called ‘Mandarins’. In turn, as Europe and the USA evolved in recent centuries, their ideas on democracy and science spread to China, inspiring great changes in China, especially during the past century. Cultures need to draw on each other’s strengths. This has always been how human civilisations evolve. The misgivings about Confucius Institutes are not only unfounded, but reflect insular and uninformed opinion. More importantly, such attitudes are denying youth of today vital knowledge that will benefit their careers. I welcome the people of Britain and Scotland, especially young people, to have your own experience of Confucius Institutes. There you can learn Mandarin and an understanding of China; both can now be key to career progress. The bridges built by Confucius Institutes will lead you to China, which offers enormous opportunities as the world’s second largest economy and second largest trading country.